Ki-67 is a cancer antigen (protein) found in growing, dividing cells but is absent in the resting phase of cell growth (when cells are not growing). The fact that Ki-67 is found in dividing cells makes it a good proliferation marker (since cancer cells rapidly grow and divide) to follow the progress of breast cancer, though its role in doing so is currently controversial. When it comes to breast cancer, the Ki-67 test may be performed on a sample of breast cancer tissue to help predict the aggressiveness of the cancer. 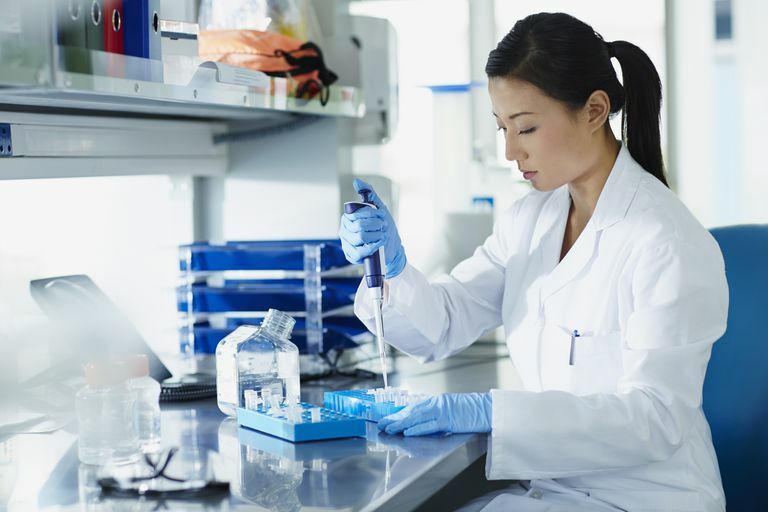 The test, which is performed and interpreted by a doctor called a pathologist, measures the level of Ki-67 expression in the cancer cells through a staining process. While the Ki-67 proliferation marker test is increasingly ordered by doctors, we aren't certain of its overall benefit, specifically when it comes to making decisions about treatment. Your doctor may order the Ki-67 test as a way to measure how quickly your breast cancers cells are dividing and forming new cells. A test result of less than 10 percent is considered low while a test result of 20 percent or higher is considered high. A "high" score means that the breast tumor is more likely to be aggressive and spread quickly. Even so, not all doctors order the Ki-67 test, so do not be alarmed if you do not see it on your pathology report. In addition, it's important to note that other tests are done to access your breast tumor, and these results, along with your Ki-67 Labeling Index (test score) may affect your treatment plan. In other words, your doctor usually takes several test results into account when trying to understand your unique cancer. For example, another test used to access the growth of your breast cancer is the S-phase fraction. This test is reported as a percentage and tells you how many cancer cells are in the process of copying their DNA. A percentage greater than 10 percent is considered high. Seeing your Ki-67 score helps you and your doctor determine your cancer prognosis or your chance of recovery. In fact, studies have found that tumors with higher levels of Ki-67 have a poor prognosis relative to tumors with lower levels. On a more positive note, research has also found that tumors with a high level of Ki-67 may respond particularly well to chemotherapy. Since chemotherapy is designed to attack all rapidly growing cells (including "normal cells" such as hair follicles), tumors that are more aggressive (divide more rapidly) may respond particularly well to these regimens. This is, in fact, why some very aggressive cancers (such as acute lymphocytic leukemia) that were once rapidly fatal, can now often be cured with chemotherapy. That said, using Ki-67 as a predictive marker of chemotherapy response is still controversial. At the current time, perhaps the most common use of this test is to predict the response to neoadjuvant chemotherapy in people with locally advanced breast cancer. Neoadjuvant chemotherapy is chemotherapy given before surgery to shrink a tumor and/or lymph nodes so that surgery is possible. Locally advanced breast cancer refers to breast cancers that have spread to the chest wall, the skin of the chest, or to many lymph nodes (usually stage 3A or stage 3B tumors). In the end, if your level of Ki-67 came back high, you may be feeling very anxious. Again, the Ki-67 test result is only one piece of the puzzle, so try not to read too much into it. Instead, talk to your doctor about how to best interpret your individual test results, and how they may (or may not) affect your treatment plan. Education about breast cancer can be empowering and help you gain some control back over your vulnerable situation. While being your own advocate for your cancer care is great, be sure to care for yourself and gain emotional support, as you navigate these complex topics, decisions, and treatments. Lastly, while reading is an excellent way to gain knowledge about breast cancer, consider joining a breast cancer support group in your community, or an online breast cancer community. Often, these groups are additional ways to stay on top of the latest research on cancer. It can also be comforting to "talk" with others who have faced the uncertainty and controversy surrounding an elevated Ki-67 test. Kontzoglou, K., Palla, V., Karaolanis, G. et al. Correlation between Ki67 and breast cancer prognosis. Oncology. 2013. 84(4):219-25. Koz, Z., and D. Dabbs. Biomarker Assessment and Molecular Testing for Prognostication in Breast Cancer. Histopathology. 2016. 68(1):70-85. Luporsi, E., Andre, F., Spyratos, F. et al. Ki-67: level of evidence and methodological considerations for its role in the clinical management of breast cancer: analytical and critical review. Breast Cancer Research and Treatment. 2012. 132(3):895-915. Perez-Lopez, M., Garcia-Gomez, J., Alves, M. et al. Ki-67 is a prognostic marker for hormone receptor positive tumors. Clinical & Translational Oncology. 2016. 18(10):996-1002. Yagi, T., Inoue, N, Yanai, A. et al. Prognostic Significance of Geminin Expression Levels in Ki67-High Subset of Estrogen Receptor-Positive and HER2-Negative Breast Cancers. Breast Cancer. 2016. 23(2):224-30.